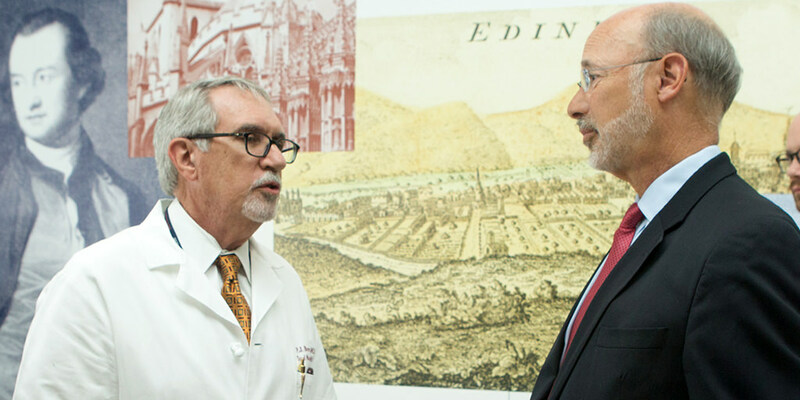 Harrisburg, PA – Governor Tom Wolf today recognized the more than 93,000 users registered with Pennsylvania’s Prescription Drug Monitoring Program (PDMP), who have helped reduce the number of patients “doctor-shopping” for Schedule II-IV controlled substance prescription drugs in the past year. The practice known as “doctor-shopping” is defined as a patient visiting five or more prescribers and pharmacies for Schedule II-IV medications, such as opioids and benzodiazepines, in a three-month period. The PDMP collects Schedule II-V controlled-substance prescription data and stores it in a secure database only available to health care professionals and others as authorized by law. This system also assists prescribers in referring patients with the disease of addiction to an appropriate treatment program. In the past 12 months, over 93,000 users registered with the PDMP. The program’s database has averaged over 1.1 million searches monthly since its inception – even achieving 53,000 searches on a weekday. The PDMP currently has interstate data-sharing abilities that allow prescribers and pharmacists to see if patients have filled controlled substance prescriptions in Connecticut, Illinois, Louisiana, Massachusetts, New Jersey, New York, Ohio, South Carolina, Virginia, West Virginia, and Washington D.C. Additionally, a one-way sharing connection has been established with Maryland, enabling its program users to search Pennsylvania’s PDMP. Starting in September, the PDMP will begin integrating with electronic health records and pharmacy management systems of all eligible healthcare entities in Pennsylvania. This will provide near-instant and seamless access to critical prescription history information to both prescribers and pharmacists across the commonwealth. Developed more than 45 treatment centers that will treat more than 11,000 individuals with substance use disorder. Expanded Medicaid to more Pennsylvanians, which now covers substance use disorder care for over 125,000 more Pennsylvanians. Secured a $26.5 million federal grant to support prevention, treatment, and recovery services to battle the opioid epidemic. Grew the number of drug-take back boxes to 665 and destroyed more than 300,000 pounds of drugs. Equipped law enforcement, first responders, and schools with the overdose-reversing antidote naloxone, reversing nearly 4,000 heroin and opioid overdoses since 2014. Strengthened the use of the Prescription Drug Monitoring Program, which enables health care providers to safely prescribe controlled substances to their patients. 93,000 authorized users have conducted more than 10 million searches since the program became operational in August 2016. To date, more than 15,000 Pennsylvanians have contacted a statewide helpline for assistance. 1-800-662-HELP is available 24/7 for those who need immediate assistance with drug and alcohol problems to talk with a person who can help. Pennsylvania residents and PDMP users can request information by contacting the PDMP office at RA-DH-PDMP@pa.gov. For more information, please browse the PDMP website for the latest updates at www.doh.pa.gov/PDMP.